Can Meridian Tapping replace the need for medication? I am bipolar 1 and suffer from PTSD. I have tried virtually every medication only to be deterred by side effects. I have also tried high-level vitamins and aminos to no avail - or they just become too expensive to continue. 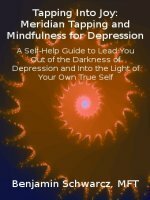 Can meridian tapping and meditation help to replace these old methods? I have tried everything and am ready to help my body and mind heal itself. Most of my bipolar clients use EFT/Meridian Tapping - both with me in sessions as well as on their own (some more than others). Most everyone who uses it finds it to be very useful in managing their symptoms -with or without the use of medication and other methods of self-help. You should always use as many different healthy practices as possible, rather than to rely only on one method of staying balanced. But the most important thing is to simply do what works for you. being nutritional issues (but there is some evidence that it can even make changes on that level as well). PTSD (and any unresolved trauma) will keep you in a state of hyper-arousal (stress) which makes you very vulnerable to Bipolar mood episodes. EFT/Meridian Tapping is excellent for eliminating PTSD and trauma of all kinds. By addressing those issues with tapping, you may be find that your moods are much more stable and you are no longer triggered by things that were once associated with those past traumas. So I am a huge advocate of using tapping for all aspects of Bipolar Disorder, along with whatever other conventional, or alternative approaches seem to help you.